When this enchanting family group appeared twice at Christie’s, London, in the 1930s, the artist was unknown, but by the time it was sold at Sotheby’s in 1951, Eversdijck’s signature, and the date, 1665, were given in its description. Today, the signature and date are no longer apparent, but the painting is unquestionably the work of Eversdijck. This Zeeland-based artist shows the clear influence of Nicolaes Maes (1634 – 1693) in his compositions and was the son of portrait painter Cornelis Willemsz. Eversdijck (d.1649), with whom he studied, and also with Cornelis de Vos (1584 - 1651). Willem was born in Goes, and seems to have flourished in his father’s trade, earning several important commissions, among them a large group portrait of Admirals, painted 1667, in the collection of the Rijksmuseum, Amsterdam – another version of which is also in the collection of the Walker Art Gallery, Liverpool, known as ‘An Allegory of the Herring Fisheries’. Antonio Roqué Rivero (1918 – 2015), Barcelona. It can be assumed that Berendt did not pay for the painting, as it was re-consigned to the 17 March sale by Sabin. Up until the March 1939 Christie’s sale, all three children, as well as the artist’s signature and inscribed date, had been visible. However, by the time of the 1951 Sotheby’s sale, the child in the upper left of the composition had been painted out. F. van der Ploeg and C.E. Zonnevylle-Heyning, Brave koppen en gladde aengesigten, Middelburg 1999, p. 112 – 114 & p. 136, no. WE5, illus. no. 107. Our group portrait bears closest resemblance to Eversdijck’s portrait of a young man with an African attendant, circa 1665, in which he presents the sitter in a similar capriccio landscape with dead game, hounds and dressed in classical attire (Zeeuws Museum, Middelburg). That painting was historically attributed to Jan Weenix, on account of its depiction of game, and the influence of Weenix is certainly apparent in both works. Recent restoration of the painting has re-revealed a young child in the guise of a putto, floating in the top-left corner. F. van der Ploeg and C.E. Zonnevylle-Heyning speculate in their book on the artist that the child was a later addition, and therefore removed by 1951. However, today it is apparent that the child was simply painted out. Rather than being an after-thought, this small angel was an integral part of the composition, representing a deceased member of the family. The infant is classically dressed and crowned with a wreath of flowers, a conceit dating back to classical antiquity, when sarcophagi were decorated with be-wreathed, mourning cupids. Eversdijck proves himself a master of texture and fabric in his portrayal of the family. While the father and children wear somewhat fanciful, classical attire, the mother is in a fashionable oyster satin gown with a pointed waist and paned sleeves lined with blue, decorated with gold lace and pearls. Her hair is worn in a mass of tight curls adorned with strings of pearls, and she sports a magnificent pearl necklace, with a black diamond and pearl broach pinned to the front of her bodice. While her daughter classically draped with roman–style sandals, nonetheless her hairstyle is of its day, and like her mother’s, hanging down in corkscrew curls, combed back tightly and done up in a bun. The inclusion of the family’s favourite horse and hunting dogs, so anthropomorphised as to appear like extra members of the family, combined with the display of dead game, enhances the sense of an Arcadian setting where role-play inevitably enlivens the representation of the sitters. The allusion to hunting pursuits is a clear reference to the aristocratic aspirations of this unidentified family – that they can indulge in one of the privileges of the aristocracy – the right to hunt. 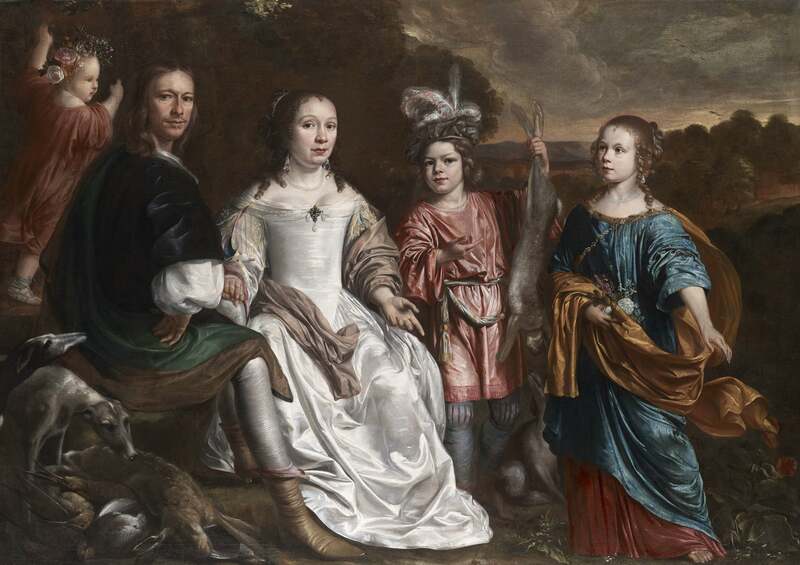 Eversdijck’s patrons all appear to originate from the province of Zeeland, and he painted a series of portraits of his own illustrious family, now in the Rijksmuseum, Amsterdam: Cornelisz. Fransz Eversdijck (1586 – 1666), a mathematician and Treasurer of Zeeland, and a pair of pendant portraits of his sister and her husband: Maria Blancardus née Eversdijck (b. 1628), and Nicolaes Blancardus (1624 – 1703), professor at Franeker, privy councilor and personal physician to Princess Albertine Agnes of Nassau. We can speculate that relining at that time may have caused the signature and date to have been lost around the stretcher bar. It is likely that the Admirals were from the deep-sea herring fishing port of Brielle, in Zeeland. See F. van der Ploeg and C.E. Zonnevylle-Heyning, Brave koppen en gladde aengesigten, Middelburg 1999, p. 113, WE9, illus. no. 108. Jan Bapist Bedaux and Rudi Ekkart, ‘Pride and Joy. Children’s Portraits in the Netherlands 1500-1700.’ Amsterdam, 2000, p. 276.